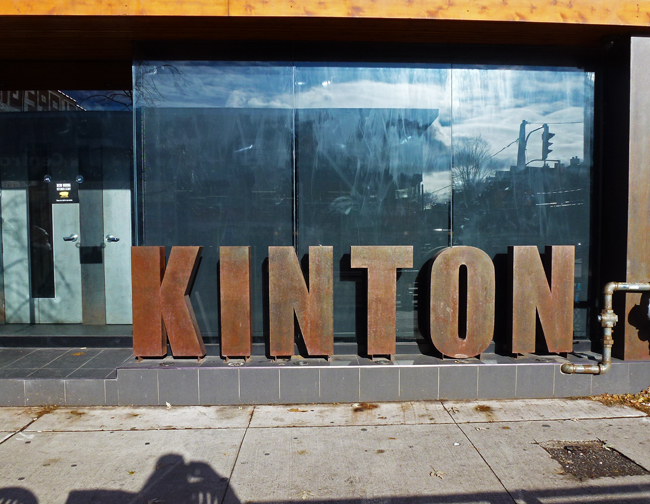 I've always liked these large free-standing Corten letters that spell out the name Kinton which is a Japanese Ramen restaurant on Bloor St W in the Koreatown district. Ramen is a type of noodle soup which you can get with all kinds of delicious additions. I've never eaten here though. In Hawaii we have saimin! These large letters make a very bold sign! When my niece and nephew were small children they loved the packages of dry Ramen noodles (with seasonings) sold in grocery stores here in the US - just add hot water! But I am sure the real thing in a restaurant is much better. This is quite an imposing sign. Would not have associated it with Ramon noodles however. You should try out this restaurant just you can report back on the quality of their food. Have a great week. There was a segment of a cooking show I watched that had a story about a tiny little Ramen shop in Tokyo that supposedly has the best ramen in the world. That was hard for me to grasp since my only concept of ramen was the little square packets you buy a the grocery store. It's certainly a sign that gets noticed! Looks to me time to try. I learned all about COR-TEN steel today! A Ramen diet is what got some people through school. I like the sign too but don't like Ramen noodles, they are too salty. ...I'll have a burger please. With the exception of that college dorm room staple, I've never had the ramen being served in fancy restaurants nowadays. Hello, I love Ramen too. The sign is nice, great reflection too. It's a strong sign Pat, no messing around there!